Philips Sonicare 9300 vs 9500: Which is the Best DiamondCare Smart Toothbrush? Are you still brushing your teeth the old-fashioned way? We have moved on to smartphones and cannot imagine our lives without it now, have you considered upgrading to a smart toothbrush? 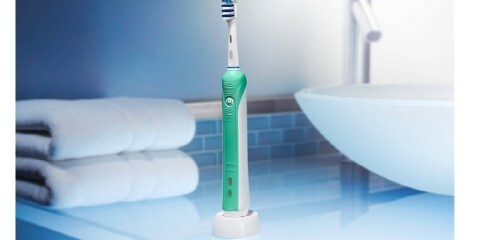 The Sonicare DiamondClean toothbrush by Philips is a high-end smart toothbrush with many different models of electric toothbrushes in the series. 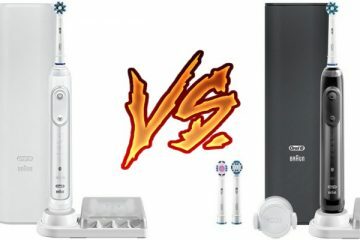 Today, we are going to compare the two most popular versions – Philips Sonicare 9300 vs 9500. Since its introduction last year, Philips claimed it to be the world’s most intelligent toothbrush. An intelligent toothbrush… how so? You may ask. 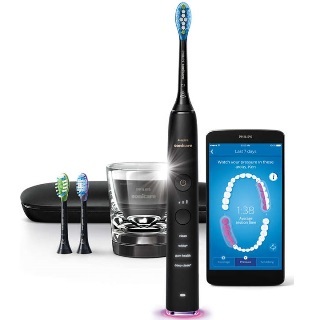 Let’s find out exactly how smart of a toothbrush Philips has created for the modern day users! The Sonicare DiamondClean Smart 9300 is fairly new to the market. It is easily one of the most comfortable smart toothbrushes out there. It is a very lightweight unit with a lot of features to whiten teeth as well as improve your overall oral condition. It boasts the ability to improve gum health conditions as soon as just two weeks of usage. The 3D mouth map allows you to track your improvements to provide a complete brushing experience. The Philips Sonicare 9300 comes with three color options: white, black & pink. It comes with four brushing modes: Clean, White+, Deep Clean+ & Gum Health giving you complete control of your personal preference. Also, it comes with three brush heads: plaque control, whitening and gum care for covering the exact needs of your oral care. A smart brush head is included which automatically syncs to the best cleaning mode for delivering the optimum performance. The adaptive brush heads allows the removal of up to 10X more plaque than normal toothbrushes guaranteeing a brilliant clean with every use. You will get noticeably whiter teeth within two weeks of use. Your gum health will improve within the first two weeks of continuous use. The ergonomic handle design offers ultimate control & comfort. The design is sleek & elegant which complements your bathroom sink. It comes with a deluxe USB case charger for easy travel & storage. Smart toothbrushes are all fairly high priced but it is justified by its long-term usage. Traditional toothbrushes must be disposed of by 2 to 3 months of use, in contrast smart brushes come with reliable warranties of up to 2 years. In addition, you will get high-end oral cleaning experience which is not achievable with normal toothbrushes. All the Philips Sonicare DiamondClean Smart toothbrushes use the sonic technology for getting amazing results. The newer Philips Sonicare 9500 is able to breakdown plaque buildup or any hidden food residue through its 31000 strokes which is comparable to a month of brushing using a normal brush. An incredible new setting Deep Clean works specifically for areas which are not easily reachable for thorough cleaning. The DiamondCare 9500 comes in four color choices of black, white, silver & pink. It comes with five brushing modes including one more than the 9300, the Tongue Care and four brush heads: plaque control, whitening, gum care and an extra tongue brush for use with the Tongue Care brushing mode. All this is enhanced with an impressive modern look further beautified with the elegant charging glass. Adaptive clean brush head is flexible & reaches every contour to ensure every spot is cleaned. Specially designed bristles gently massage gums in a crisscross action by removing plaque and improving gum health. Diamond Clean works to reverse effects of gingivitis and periodontal infection. The Gum care brushing mode improves blood flow to strengthen immune system. Save costs by lowering your dentist or hygienist visits. wireless charging & a USB charging port to be used with devices like phone or laptop. The Philips Sonicare 9500 is everything that the 9300 offers and more! It is much more expensive than the 9300 but the 2 year manufacturer warranty will ensure that you are hassle free in its long term usage. The color options, brush heads, brushing modes and all the extra features for a high price is justified by the warranty and exception brushing experience. The results achieved using a smart toothbrush by Philips Sonicare is simply not attainable using your normal everyday toothbrush. The DiamondClean Smart series has refined features for a more sleek & elegant look. A second button in addition to the power button is introduced for controlling the intensity of the brush. LED lights signal which mode of brushing is currently in use. The many color options highlight the beautifully designed smart brush and will enhance the look of any bathroom sink. Philips has always focused on stylish look for its devices and the DiamondClean Smart is no different. The ergonomic design of the handle gives it a more comfortable grip and superior control. The handle is a single piece without unattractive joints in various sections allowing it be easily kept clean. The DiamondClean Smart uses an attractive charging glass which is amazing to look at! The method is simple & convenient. You simply drop it in the cup and it starts charging after you are done brushing. They both are smart toothbrushes that come with the app for a more personalized brushing experience to improve your oral healthcare. Use of the app ensures that you are getting the most out of the smart brushes but they are completely independently usable without the app as well. The Philips Sonicare DiamondClean series comes with an array of brush heads each with the objective of delivering optimum results. The brush heads are built with smart chips which communicate with the brush to know which brush head is currently in use. This way the app is able to monitor your routine and condition of your teeth. While the smart brush heads automatically select optimum settings, you can use it with regular brush heads by controlling the mode & intensity on your own. Each brush head has an individual objective such as plaque control, gum care and whitening. So you are getting different designs and hardness with each brush head for customized oral care. Both smart toothbrushes feature a range of brushing modes such as clean, white+, gum health & deep clean+. Each of them have different brushing duration and intensity for their individual goals. Switching between the modes is as easy as pressing a button. Also, there are different brush heads enhance the performance of each of the brushing modes. Both versions are high-end products which deliver on the high price with the ultimate brushing experience. They are very quiet and are soothing to use compared to others which tend to be irritating. The overall brushing experience is definitely of 5-star quality and every use is truly better than a month’s use of a normal toothbrush. The Sonicare 9300 comes in three beautiful color choices of white, black and pink. While the Sonicare 9500 offers these three distinctive color options, it also has an added color choice of grey. The grey color version is different from the black as it is a good blend of blue/grey for a unique look. The Sonicare 9300 includes three brush heads with it, plaque control, gum care and whitening brush heads. The Sonicare 9500 comes with an additional fourth brush head, which is the tongue care for advanced cleaning features for the tongue. In terms of the brushing modes, the Sonicare 9300 comes with four brushing modes Clean, White+, Deep Clean+ & Gum Health. In addition to these four, the Sonicare 9500 comes with an additional fifth brushing mode, the Tongue Care which pairs with the tongue care brush head for optimal results. The travel charger is meant for the safe storage and charging of your brush. Both the 9300 and 9500 have upgraded versions of the travel charger from the older DiamondClean series. The Sonicare 9300 comes with a premium charging case. But the 9500 comes with a charging case which offers additional charging option using USB port with devices such as mobile phones, laptops, power banks, etc. The DiamondClean series by Philips Sonicare is without any doubt one of the best smart toothbrushes available in the market today. It is guaranteed to provide the best oral care performance for you with visible results as soon as two weeks of regular use. But after this comprehensive review, have you decided on your choice for complete oral care? 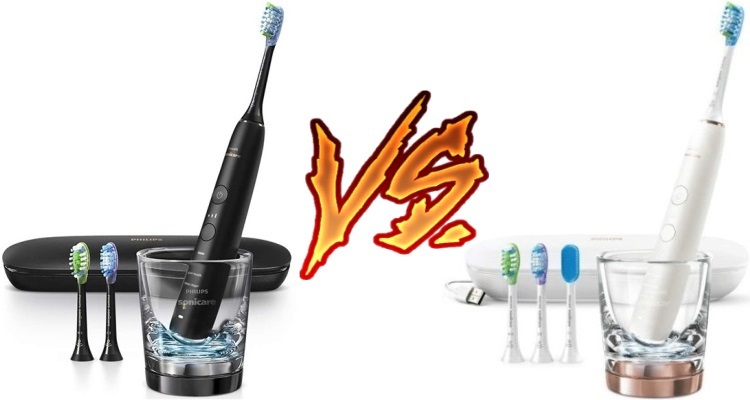 So are you wondering who has our vote in the battle of the Philips Sonicare 9500 vs 9300? Both of these are exceptional quality smart toothbrushes, but we choose the Philips Sonicare 9300 as our most recommended between the two. 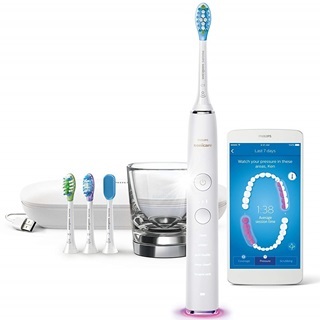 The DiamondClean Smart 9300 offers the much needed features from a modern-day smart toothbrush for a more reasonable price compared to the 9500. Grab your preferred color choice of the Philips Sonicare 9300 for a bright smile and complete oral healthcare! 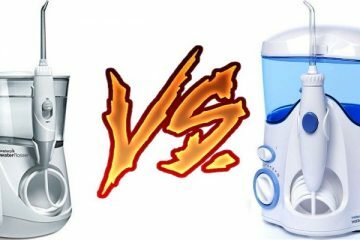 Read more: Philips Sonicare 9500 vs 9700: Which is Better?